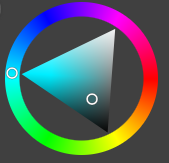 Just wondering if you have thought of implementing an HSL mode for your color editor? It's usually a more intuitive way for users to select colors and most graphic software supports this mode. I should have been more clear. I am aware of the picker - I was asking for being able to pick, either via the color picker or sliders, a color from the HSL color space. HSL is also more clearly represented via a triangle. So you mean that you'd like to swap in HSL edit boxes on the right in place of the RGB ones now? Or are you looking for them to be in addition to the RGB ones? Either would work but probably adding HSL controls would be the most useful. To confirm, you like to be able to input the Hue, Saturation, and Lightness values directly via the keyboard instead of (or addition to) using the RGB text entry. Do you have any screenshot URLs of other color pickers that have HSL input that you'd like to emulate? We love Affinity Designer too and now use it in place of Adobe Illustrator. Looking at our ColorPicker control in Editors, the problem is that we already have 5 rows of text entry. There is a hex color TextBox, and edit boxes for ARGB. Adding three more edit boxes for HSL would make that stack of input controls too tall. We could possibly stick another column on the right, or have some toggle control that switches between RGB/HSL. The other thing is that the radial slider and box slider currently allow you to modify the HSL values, since that's what they are effectively for. It's just that the picker doesn't show the actual numbers. Do you need to have text entry of HSL or would just showing the HSL numbers be enough if we added some display of that? That would allow us to conserve space, keep element count down, and like I said above, you are already modifying the values with the sliders. Having a toggle mode selector might be the most straightforward approach. I don't thing people need to modify via RGB and HSL at the same time. We've implemented a RGB/HSB toggle for the upcoming maintenance release build 662.